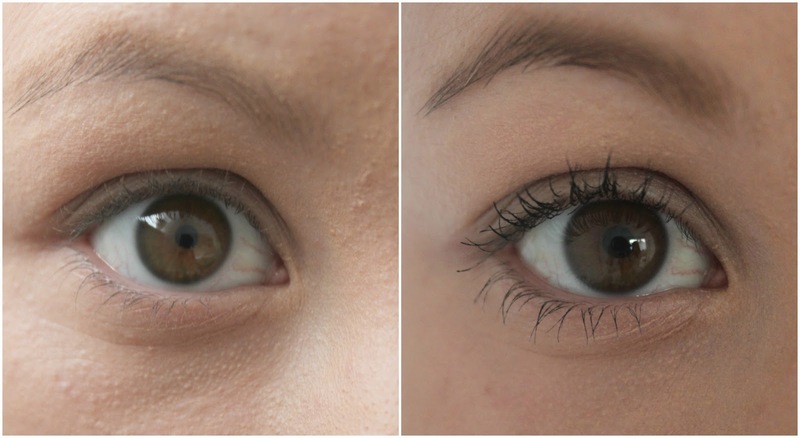 It's been a little while since I've done a review, and as I've recently starting using Benefit's They're Real! Mascara, I thought it'd be the perfect product for me to review. This mascara is one of the many product samples included in the Glamour Beauty Box I bought a while back yet this mascara is one of the last products out of the box I've tried. Remember this is only the sample version, the normal product is bigger and shaped a lot differently, not that it really makes a difference! I can't really comment on the packaging as it's different to the normal product, it's a grey bottle with a silver screw top lid with the classic logo and product name, simplistic yet effective. I have no complaints, it's easy to hold and easy to use! The mascara wand is rubber with lots of small bristles and of course the big thing about this mascara is bristles on the end so you're able to use it vertically to catch the small lashes. Great idea. After one coat you can notice a big difference. I don't have the longest lashes and they're quite thin so a mascara like this works quite well for me. You're able to coat every lash without any clumps or lashes sticking together. I'm not overly fond on using it on my bottom lashes as I'd rather they had less volume. It doesn't give me the false lashes Benefit claim it should, even after several coats but it makes a big enough difference with just one negative.. that it's not waterproof and I'm sure many of you agree with me on this! It's just a major downfall especially for someone like myself who suffers with watery eyes nearly every day. Hopefully they'll end up bringing out a long-awaited waterproof version. Benefit advertise this mascara as the UK's best selling mascara and there's clearly a reason for it being so popular. I can't believe I've only just starting using it really and I'm sure I'll purchase the product when the sample runs out. Do you use this mascara? What's your opinion?